Here again Machiavelli refers to Francesco Sforza his favorite example of a prince who acquired his principality by his own ability. As regards action, he ought above all things to keep his men well organized and drilled, to follow incessantly the chase [hunting], by which he accustoms his body to hardships, and learns something of the nature of localities, and gets to find out how the mountains rise, how the valleys open out, how the plains lie, and to understand the nature of rivers and marshes, and in all this to take the greatest care - which knowledge is useful in two ways. Firstly, he learns to know his country, and is better able to undertake its defense; afterwards, by means of the knowledge and observation of that locality, he understands with ease any other which it may be necessary for him to study hereafter; because the hills, valleys, and plains, and rivers and marshes that are, for instance, in Tuscany, have a certain resemblance to those of other countries, so that with a knowledge of the aspect of one country one can easily arrive at a knowledge of others. And the prince that lacks this skill lacks the essential which it is desirable that a captain should possess, for it teaches him to surprise his enemy, to select quarters, to lead armies, to array the battle, to besiege towns to advantage. Philopoemen, Prince of the Achaeans, among other praises which writers have bestowed on him, is commended because in time of peace he never had anything in his mind but the rules of war; and when he was in the country with friends, he often stopped and reasoned with them: "If the enemy should be upon that hill, and we should find ourselves here with our army, with whom would be the advantage? How should one best advance to meet him, keeping the ranks? If we should wish to retreat, how ought we to pursue?" And he would set forth to them, as he went, all the chances that could befall an army; he would listen to their opinion and state his, confirming it with reasons, so that by these continual discussions there could never arise, in time of war, any unexpected circumstances that he could not deal with. Machiavelli probably selected Greek general Philopoemen (252 BCE - 183 BCE) for his example because Philopoemen enjoyed an outstanding reputation in (Machiavelli’s model state) Rome where he was known as "the last of the Greeks,"
The Greek historian Arrian of Nicomedia in The Anabasis of Alexander (Chapter XII, Page 38) reports that when passing through Troy on his campaign against Darius, Alexander the Great placed a wreath on the tomb of Alexander and Achilles. 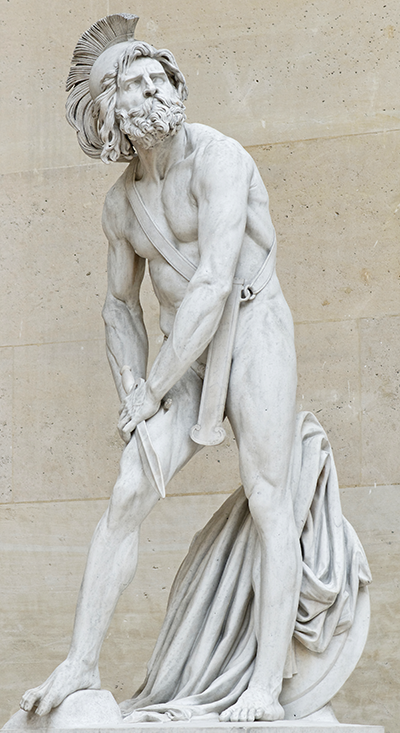 This is an 1837 sculpture (now in the Louvre) by David d'Angers of Philopoemen, hurt. He was, in fact, hurt at the Battle of Megalopolis, where he was strategos (general) of the Achaean League against Sparta. Attribution: By Pierre Jean David, alias David d'Angers (1788–1856) (Marie-Lan Nguyen (2011)) [Public domain], via Wikimedia Commons. Scipio Africanus (236 BCE - 183 BCE) is another character from Machiavelli’s model state Republican Rome. He defeated Hannibal at the Battle of Zama in the Second Punic War. Machiavelli tells us that this famous general and statesman was greatly influenced by the biography of Cyrus the Great by Xenophon called Cyropaedia, which translates as "The Education of Cyrus." We can see from the title that this book is similar in its intent to Machiavelli’s own work, The Prince. In fact, Xenophon‘s was an early example of a literary genera, called “mirrors of princes, or on princely rule.” This genera was popular in the middle ages and The Prince is in that tradition but it is an atypical and ironic example. Most “mirrors of princes” books are idealistic in tone, much like the Pope’s Christmas message, which routinely tells us that all we need do to cure the world’s ills is to change human nature. By contrast Machiavelli is decidedly pragmatic, and (except for his patriotism) not at all idealistic. Pragmatism is a hallmark of the school of thought (political realism) that Machiavelli pioneered. It is a guiding principle of political realism that if prudent, constructive political policy must take human nature as we find it. To me, living in our present age of corrosive ideology, that pragmatism is part of Machiavelli’s charm.